The Rugby Gaels held their 18th Annual Awards Night in Hilmorton Manor Hotel. The squad members had a very good night with Christy Pepper providing the music. The Player of the Year went to Fenton Collins for his tireless work in midfield throughout the season. This award is named after Tom Kelleher who was a founding member of the Gaels and sadly passed away earlier in the year. The Sean Quigley Plate for Young Player of the Year went to Oisín McKenna. Mick Treacy who is stepping down as manager after three years received the Gridline Club Man of the Year for his efforts. The last award of the night was a special one for the Gaels. It was The Nicola Biggins Memorial Award. 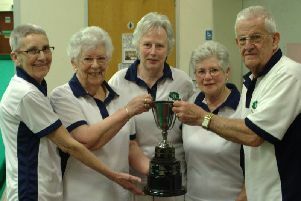 Nicola was very much part of the club for years serving as treasurer. She died of cancer at a young age in 2014. The chairman Mick Treacy presented the award to Neil Merrigan, who is current vice Chairman and is a founding member of the club.